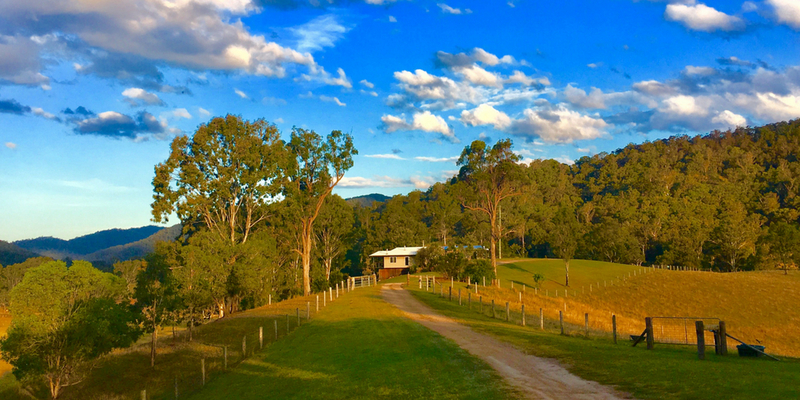 Can you imagine staying in a luxury cottage nestled on the side of a hilltop in the beautiful Sunshine Coast Hinterland in Queensland Australia? The only sounds that break the silence coming from the laughter of kookaburras, the bleating of lambs and rustling of the trees? 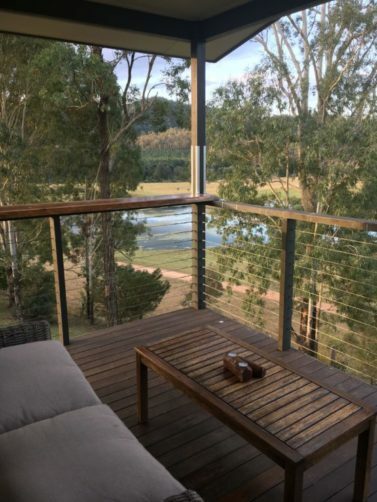 With lovely views across the valley and a lake below the cottage home to native birds and fish? 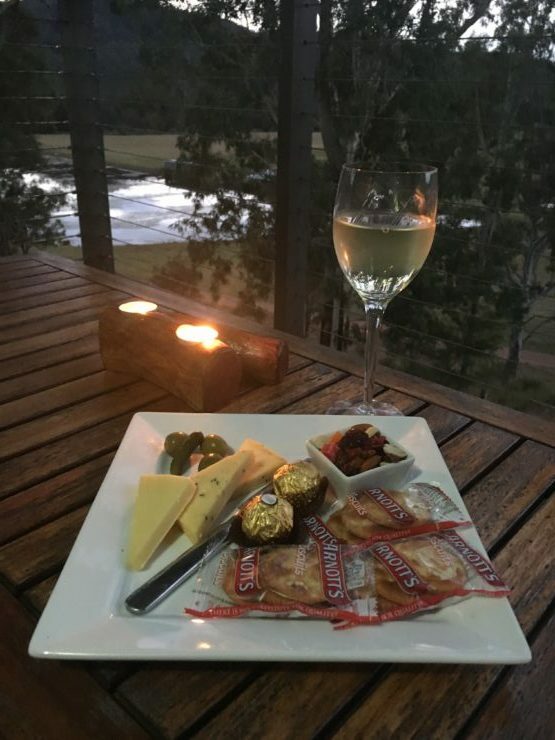 If you are searching for wonderful accommodation in Sunshine Coast Hinterland where you will (to quote their website) “lose yourself in the romance of nature” then a stay at Yabbaloumba Retreat is a must! 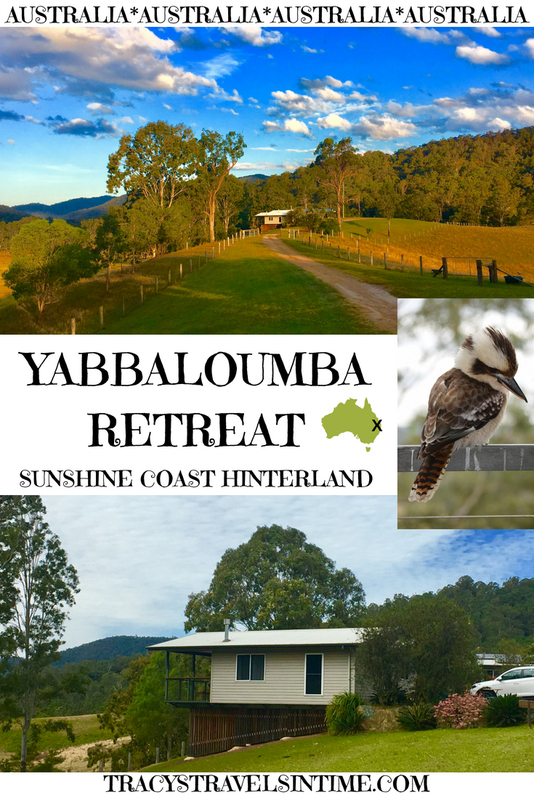 Yabbaloumba Retreat can be found in the Mary Valley about 90 minutes drive north of Brisbane. 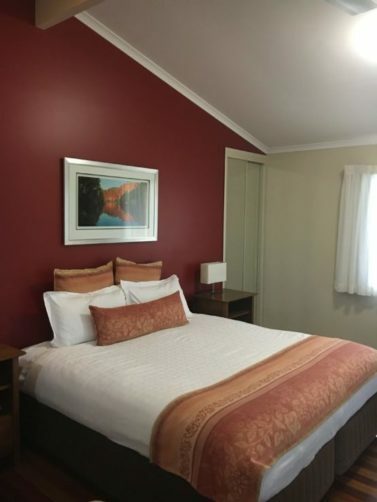 The retreat borders the Conondale National Park and the Imbil State Forest and is nestled between two spring fed creeks. 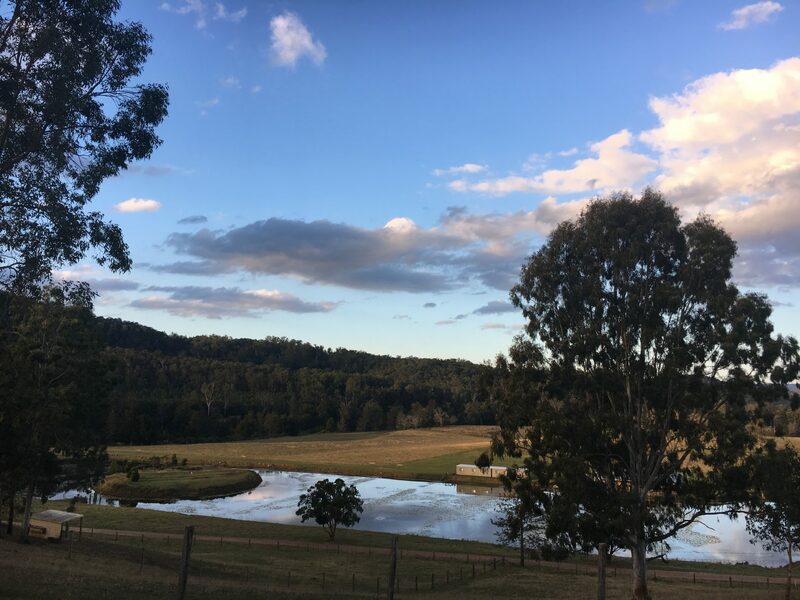 The two creeks – Little Yabba and Booloumba – create the name of the retreat. 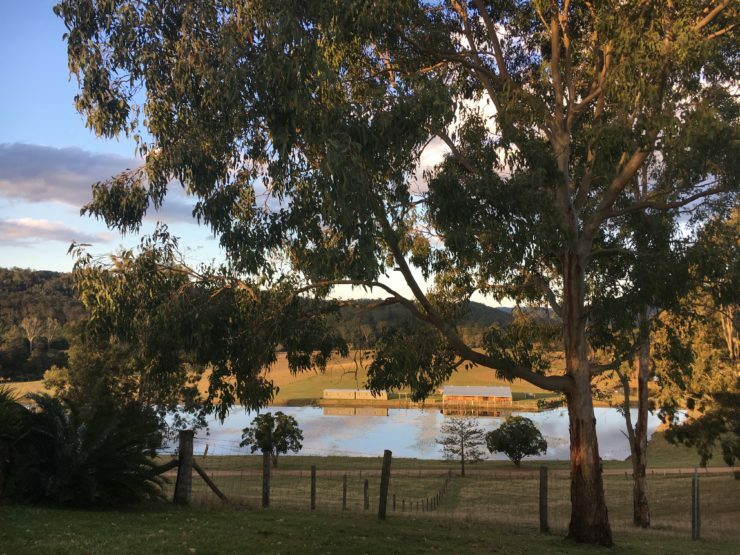 As a working property sheep, cattle, guinea fowl and geese can be seen in the grounds and the beautiful lake overlooked by the cottages is full of Australian Bass. 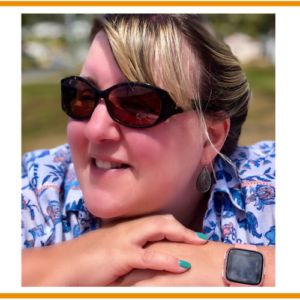 This is the perfect setting for a break away from the hustle and bustle of busy lives and the warm welcome from your hosts Lloyd and Barb Campbell will make you feel immediately at home. When you arrive at the resort drive up to the main house, park there and walk up to the reception. We were met by a very welcoming and friendly Barb. Once checked in Barb took us on a short stroll to see the new lambs that have arrived on the farm over the past month and explained a little about the retreat. We drove back down to our cottage (literally 1 minute from the main house) and parked outside directly outside the front door. 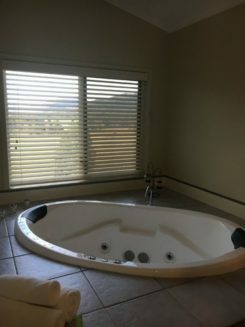 Each of the luxury cottages are beautifully appointed including a kitchen with modern appliances, a comfortable leather lounge, a gas fireplace, king size bed, heated spa and spacious bathroom. 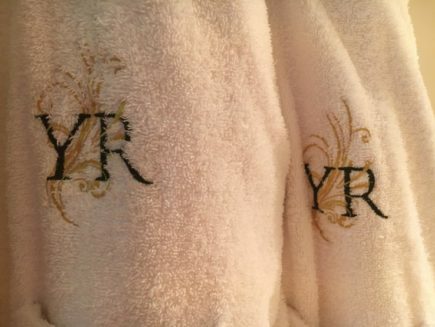 In the bathroom you will find Pure essence toiletries and a monogrammed bathrobe each. A home theatre system and access to an extensive DVD library are available to keep you entertained. (Borrow DVD’s from reception) The TV can also be repositioned and watched from the comfort of the spa! The spa bath (big enough for two) offers fabulous views across the valley. After dark light the candles and relax in the spa and enjoy a glass or two of the complimentary wine and cheese platter. The reverse cycle air-conditioning is guaranteed to keep you cool in summer. If visiting in winter light the gas fire and enjoy the ambiance created by its warm glow. The cottage is stocked with everything you could possibly want or need and we loved the binoculars and bird book which were a very thoughtful inclusion. Warm croissants are delivered to your door in the morning and all ingredients needed for breakfast can be found in the fridge. Bacon, mushrooms, tomato, muesli, milk, butter, yoghurt, a fruit, platter, jam etc are all provided for you to cook up/create a hearty breakfast. 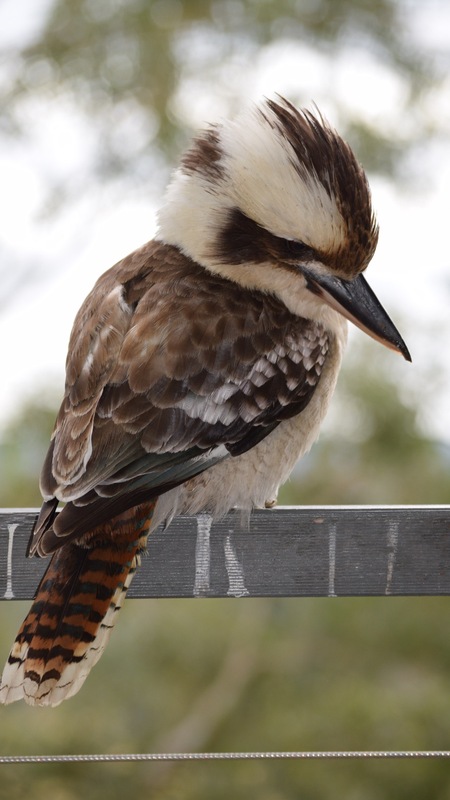 Sit on your private balcony and enjoy breakfast with the kookaburras (who will fly down to join you) Just make sure you keep an eye on your food as they have been known to help themselves to unattended plates! As well as the 4 luxury cottages there is also a deluxe cottage with disability access available to book. 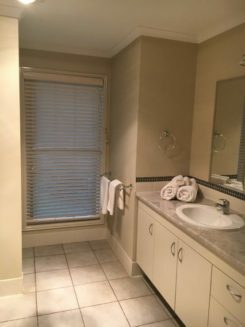 This cottage is equipped with the latest disability aids in the bathroom to ensure anyone with specific needs can be accommodated. As well as the cottages Yabbaloumba also hosts weddings in their venue ‘The Shed.” I have bookmarked this for my daughter in the future! With fabulous views across the valley and the beautiful lake I can’t think of a more stunning setting for a wedding. Wifi access is limited to non existent so unplug, unwind and enjoy the peace and quiet of your beautiful surroundings. Enjoy a stroll in the grounds or sit on your private balcony listening to the sounds of nature all around you. We stayed at Yabbaloumba for only one night but we will definitely be returning for a longer stay very soon. 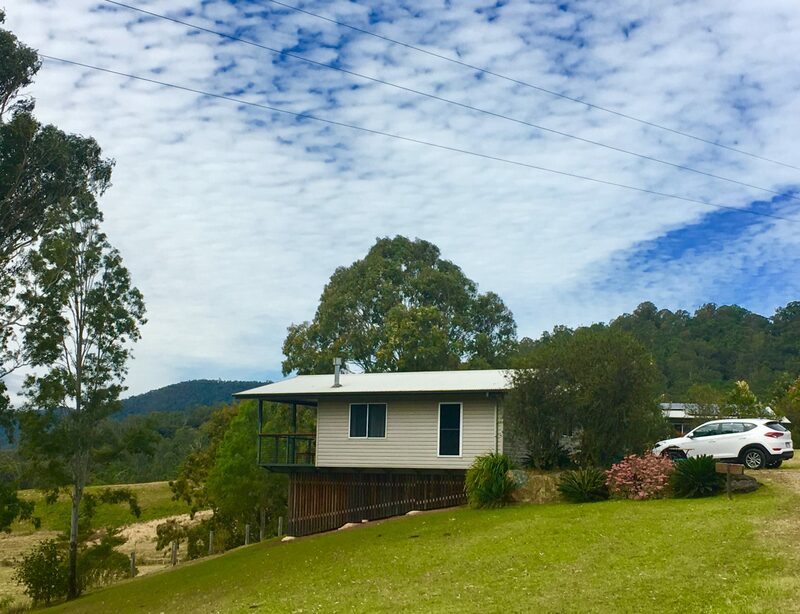 LOCATION – Yabbaloumba is situated approximately 90 minutes north of Brisbane in the Sunshine Coast Hinterland. 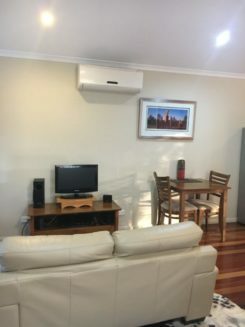 From Brisbane take Exit 188 – Steve Irwin Way exit travel through Landsborough towards Maleny. Stay on Maleny-Kenilworth Road. Travel for 30km out of Maleny and turn left into Booloumba Creek Road. Yabbaloumba is approximately 1.18km on the right. 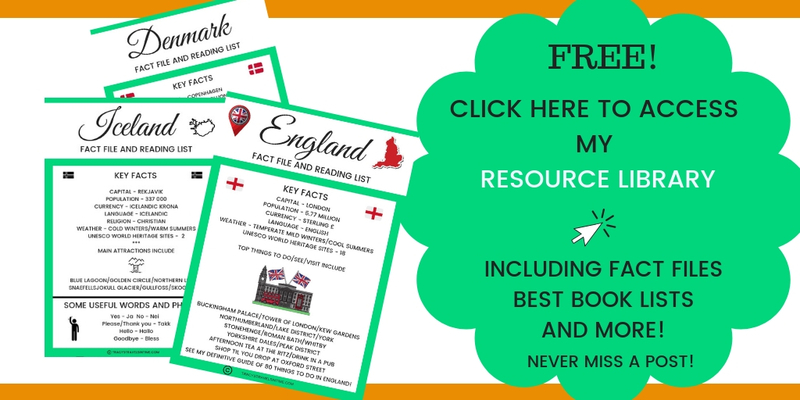 RATES – Rates vary depending on the time of week you stay. 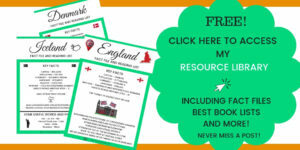 For bookings call 07 5446 0787 or make a booking on their website. 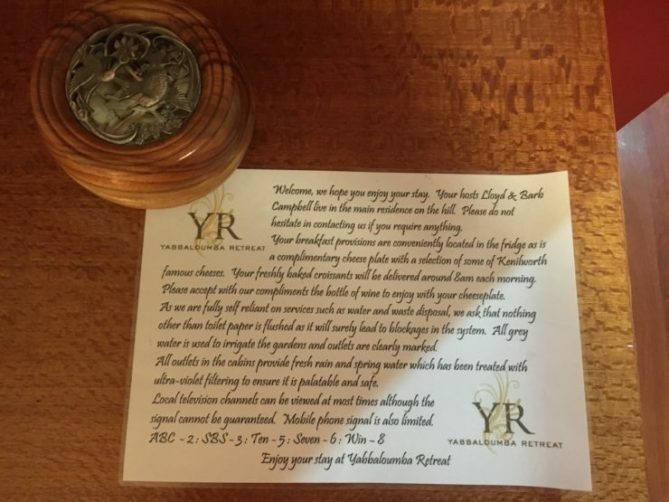 Yabbaloumba has been specifically designed for couple stays. 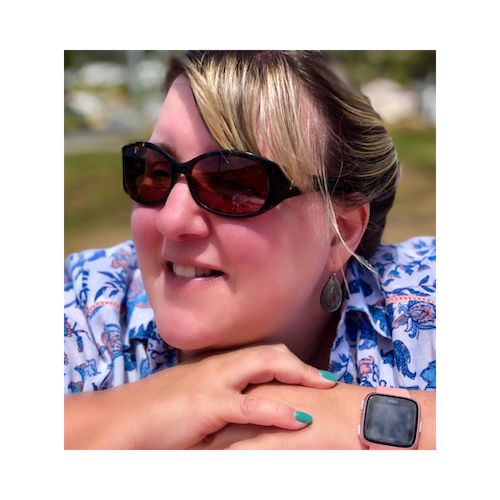 And as such it provides the perfect couple getaway – it is in a beautiful spot, is quiet, relaxing and provides everything you need for a few days of down time. It gets a 10/10 from us! 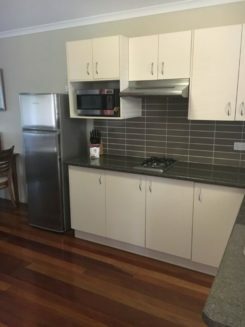 Previous Post Living Down Under – one year in!